The Products Menu allows you to view all of the products you currently have in Salsify. You can also view all of your Salsify Lists in the Products Menu. The Digital Assets Menu allows you to view all of the Digital Assets you currently have in Salsify. 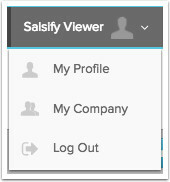 Selecting the More menu gives you access to several capabilities in Salsify. For more information on any of the following, log into Salsify and choose the Knowledge Base link from the menu at the far right of the top menu bar. Channels are where you transform and publish products and digital assets associated with products. You can set up workflows, publish to retailers and other endpoints and more. 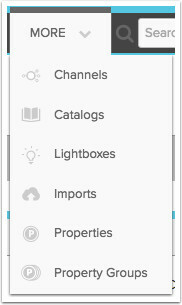 Catalogs let you configure a set of products and properties to share electronically outside of your Salsify account. Catalog viewers see just the details you choose in a branded catalog, and you can set up a download of information and/or digital assets. The Imports screen is where you import existing product information to Salsify. You can do individual imports from spreadsheets, or set up scheduled and recurring imports from other systems. Customize the data you store in Salsify with Properties. Store product information however it best works for your organization, and organize the view of that information with Property Groups. The search bar in the top menu allows you to quickly find products, images, channels, digital assets and catalogs. Use it when you know the name of the item you're looking for. It returns the first five results that match under each item type. Product search and filtering allows you to narrow product search results to only those products, and as many products that match the criteria you set. And when you have a set of products you want to use again, you can save these criteria to product lists. Click the menu under your name to administer your account. Use My Profile to update your password and notification subscriptions, My Company lists users and allows administrators to invite new users. When you have tasks to complete in workflows, they will be listed here. Workflows allow an organization to assign pieces of product content to different individuals or teams to complete. Need help? We're always here. 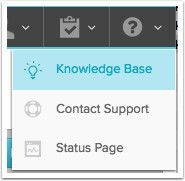 Choose Knowledge Base for documentation and how to for Salsify features, or choose Contact Support to shoot an email to our Customer Success team. Choose Status Page to get the current status of the Salsify app, and subscribe to status notifications. Click here to view the status page and sign up for notifications.